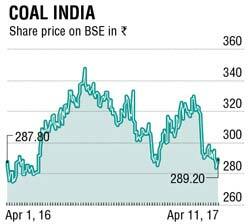 The government’s ambitious effort to open up coal mining to private and foreign players and end the virtual monopoly of Coal India Ltd (CIL) might come a cropper if some of the restrictive conditions put in the proposed guidelines are not reworked. Private miners – Indian or foreign – would be allowed to sell coal mined by them only at a minimum price, which shouldn’t be less than 20% above the price that CIL currently charges, the draft rules now put out for discussion says. The provision, which surreptitiously aims at protecting CIL’s interest, is being seen as restrictive defeating the very purpose of opening up the sector – to bring in greater efficiency and economy in mining through investment in state-of-the-art machinery, thereby bringing down costs leading to lowering of prices, feels industry experts. “The condition of making the minimum selling price by a commercial miner fixed at 1.2 times the price at which CIL sells its coal is restrictive as it would discourage efficient mining. The whole purpose is to bring down costs and prices through higher mechanisation. Now that there is little scarcity of coal, why would anyone buy coal from a private miner if the same quality would be readily available from CIL at a lower price?” Partha Bhattacharya, former chairman of CIL and a key voice in the industry, told DNA Money. “Making such a price the basis of a revenue sharing model makes the whole thing flawed,” he said. “While the successful bidder would be free to decide its marketing and pricing strategy, the revenue sharing would be calculated on the basis of actual revenue or actual production multiplied by 1.2 times the CIL ROM price for the average grade of coal for the specific mine, whichever is higher,” the draft regulation says. To begin with, the government plans to auction two to three large mines having peak-rated capacity of 30 million tonne a year and coal of grade-11 to grade 13 in the first phase, the discussion paper said. “The minimum price fixed at 1.2 times is restrictive. Also, based on that, what would be the revenue sharing is still not clear,” V K Arora, chairman of mining and construction equipment committee of industry body CII and chairman of Indian Mining Federation, said. While Bhattacharya believes a “tangible net worth” criteria of Rs 1,500 crore might keep away many experienced miners, Arora said it wouldn’t pose a problem as bidders can form joint venture even with foreign entities. “You can have a joint venture with a partner, which could be a foreign entity having a combined mining experience of 25 million tonne. It is a reasonable condition and a welcome move,” Arora said of the minimum work experience criteria. “We welcome this major move to open up the coal mining sector and believe some of the contentious provision might get amended after feedback of stakeholders are taken care of,” Subhasri Chaudhuri, Secretary General of Coal Consumers’ Association said.